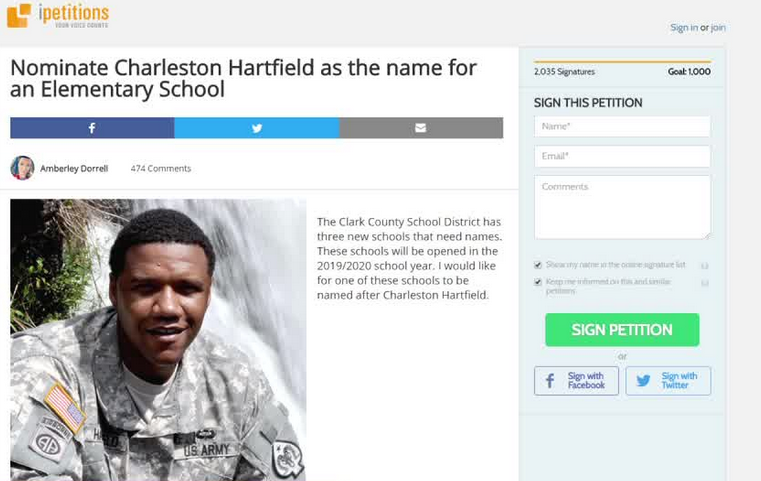 A teacher who knew Officer Hartfield through the Army National Guard started a petition online for Clark County to name one of its new schools in his honor. A teacher who served in the military with Charleston Hartfield is trying to honor the police officer and 1 October victim by naming a school after him. Thousands of kids just starting their education could be reminded of a hero every day. That's because one of three new Clark County public schools currently in construction could bear the name of officer Charleston Hartfield, the off-duty police officer who died in the mass shooting on the strip. The petition is online. It has more than 2,000 signatures so far. She's working on the formal naming application now. It's due Friday, July 13. The teacher who started this says she's spoken to Hartfield's family and has their blessing. Hartfield was her first leader and role model when she joined the military. "He was exactly what a first sergeant is: the disciplinarian, the father figure, the go to, the confidant and his soldiers knew they could come to him with anything," said Amberley Dorrell, the teacher and national guard member who is trying to name a new school. Any of the three new schools could bear Hartfield's name. The board of school trustees will get the final say.